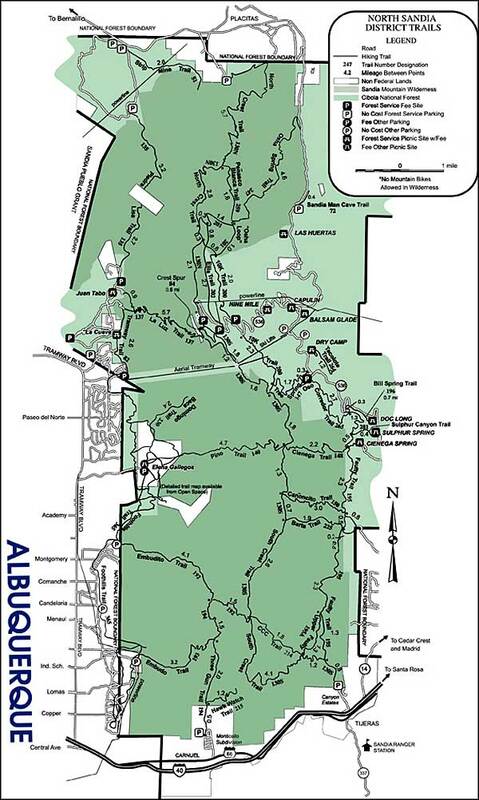 Because the Sandia Mountain Wilderness is so close to the eastern edge of Albuquerque, the 117 miles of well-maintained trails here see more use than any other trail system in New Mexico. 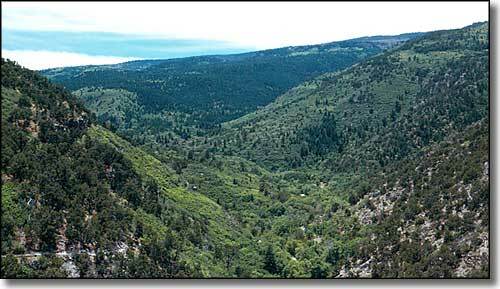 The 37,877 acres of Sandia Mountain Wilderness are mostly on the western slopes of the Sandia Mountains, but pieces of the Wilderness do cross over to the eastern side of the crest near the north and south ends. Most of these slopes are heavily treed with spruces and firs at the top and covered with ponderosas and other conifers in the middle. These mountains see a lot of migrating raptors in the spring and fall. There's a good population of mule deer, coyote and black bear up here, too. There's an enclosed tram that makes the journey from Tramway Boulevard to Sandia Crest, affording some great views of the area while being suspended high in the sky as it makes its way (about 2.7 miles) up (4,000') the hill. From the top you can access the Crest Trail, 26.5 miles of trail running along the crest of the Sandias at the top edge of the Wilderness. Anywhere you go here, you'll want to carry your own water. 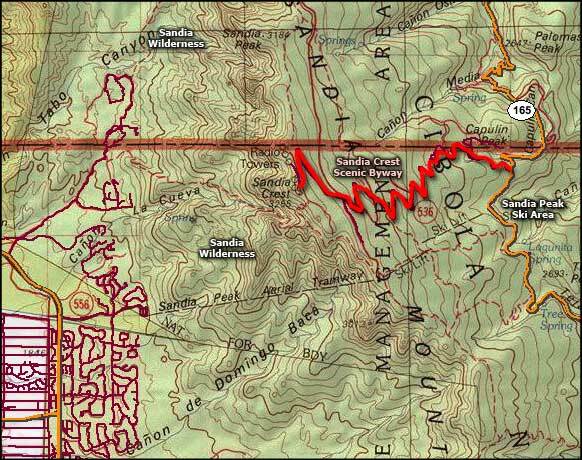 Sandia Mountain Wilderness is entirely within the boundaries of Cibola National Forest. The top ridge of Sandia Mountain is often very windy. 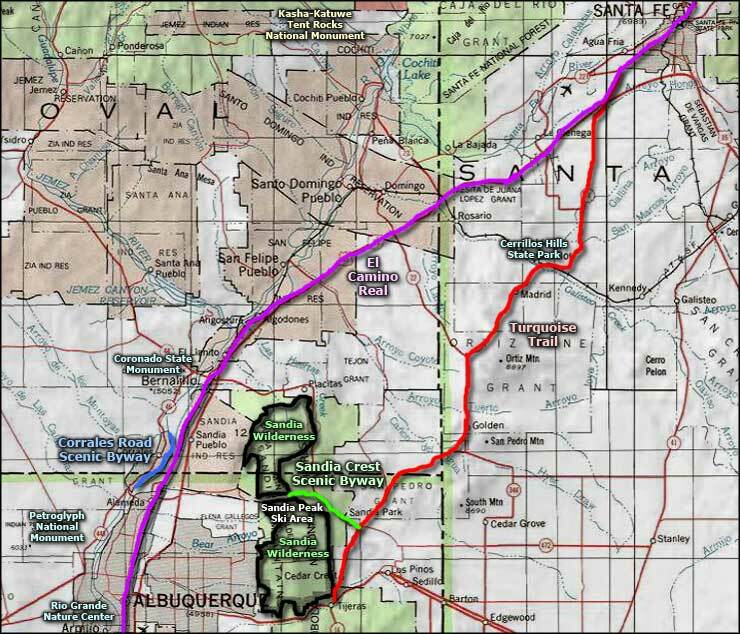 In the past, there have been hang-glider races run with Sandia as the starting point and folks flying off to the east. The majority of hiking trails are accessible from routes coming east off Tramway Boulevard in the city below. Not very many of them access the upper ridge of the mountain as that last several hundred feet of elevation tends to be very vertical. 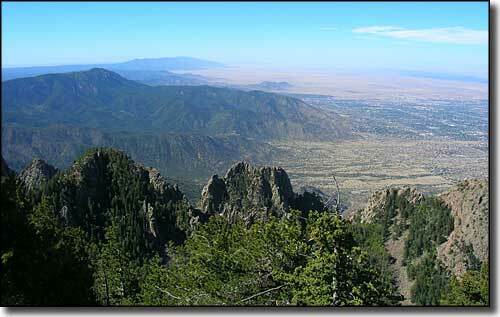 Most folks access the Crest Trail by driving to the top of Sandia Crest Scenic Byway and parking in the pay lots there. Some folks also ride the tramway up, or use the ski lifts on the eastern slope. There are restrooms, a concession and a small restaurant there, too. Cell phones and GPS systems don't work well near the top of the mountain because of the large nest of radio and TV transmitters located there. 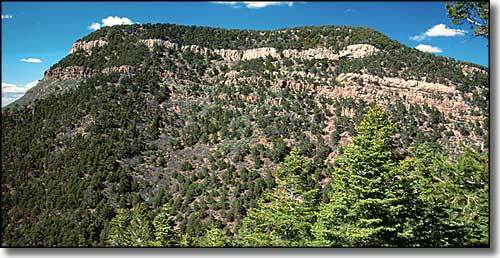 Photos of Sandia Mountain Wilderness courtesy of the National Forest Service.